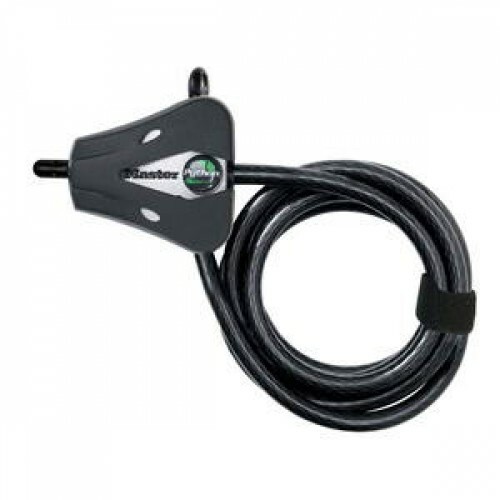 The Master Lock Python tree stand lock provides a security solution for tree stands ATV's vehicle roof rack and more. The cut-resistant braided steel cable adjusts to any position from 6 in to 6 ft. The pick-resistant tumble locking mechanism features an Advantage Timber High Definition camo finish. Cut-resistant 6-ft x 5/16-in (8mm) braided steel cable Cable securely locks to any position from 6-in to 6-ft Durable ABS bumper with a scratch-resistant finish Pick-resistant pin tumbler locking mechanism Easy-to-use VELCRO brand strap holds excess cable in place.